Lynnwood, WA : Emerald Books ; [Seattle, WA] : Distributed by YWAM Pub., c2002. 193 p. : map ; 21 cm. A narrative biography of American abolitionist Harriet Tubman, who escaped slavery and led others to freedom as a conductor on the Underground Railroad. 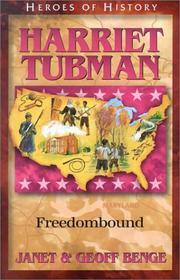 Harriet Tubman : freedombound / Janet & Geoff Benge. Antislavery movements--United States--History--19th century--Juvenile literature. $c Statement of responsibility Janet & Geoff Benge. 504 BibliogEtcNote $a Bibliography, etc. note Includes bibliographical references (p. 193). 505 ContentsNote 0 $a Formatted contents note You ain&apos;t goin&apos; back -- Big changes a comin&apos; for you -- One of the lucky ones -- Not worth sixpence -- He would never ever own her soul -- We&apos;ve got to go north! -- Guided by the North Star -- Time to conduct her passengers -- Moses -- One more soul got safe -- Free at last -- The Battle of Troy -- This is the first day we have ever had a country -- The best man for the job -- Finally headed home. 520 Summary Etc. $a Summary, etc. note A narrative biography of American abolitionist Harriet Tubman, who escaped slavery and led others to freedom as a conductor on the Underground Railroad. 650 Subj:Topic 1 $a Source other than LC Slaves. 650 Subj:Topic 1 $a Source other than LC Underground railroad. 650 Subj:Topic 1 $a Source other than LC Antislavery movements. $d Dates associated with a name 1958. $t Title of a work Heroes of history.